If you’re feeling stuck, negative, sluggish, or even depressed, it may be due to some stagnant energy in your life. Your personal space includes your entire environment -- home, work, and other physical spaces that you visit. Stagnant or negative energy can have detrimental effects on your mental and physical state and is even believed to manifest into things like a lack of happiness and success as well as pain and disease. Smudging can help combat this negativity by clearing the energy in your life. 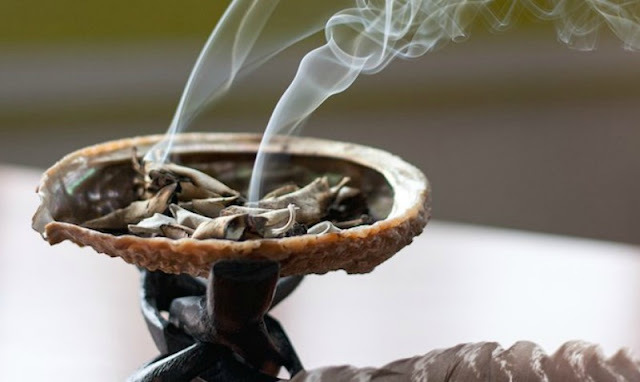 But, traditional smudging -- the ancient ceremony of burning sage, isn’t always an option for those of us sensitive to smoke or in public places. So, what can we do when we need to clear and bless our space? Happily, there are alternatives. One nice alternative is using an essential oil diffuser. Essential oil diffusers are easy to use and can do a good job, but they aren’t particularly practical to use at work or you mother-in-law’s home. Another really great alternative is smudge spray. I found Moonwater Elixirs. This company makes Sage Plus Clearing Spray that is infused with Clear Quartz Crystals, which are known for their ability to amplify the energy of intention. Moonwater Elixirs Sage Plus Clearing Spray is incredibly easy to use and is so effective, plus it’s rather speedy at clearing the energy in your space. All you need to do is spray the healing elixir and you do not have to spray a large area to feel the effects. Did I mention that Sage Plus Clearing Spray is comprised of organic white sage plus supportive Lunar Energy as well as crystal and Reiki Energy? So, yes it gets the job done! Moonwater Elixirs Sage Plus Clearing Spray is available online at https://moonwaterelixirs.com/pages/sage-smudge-spray and you can receive a 50% discount using code 17331POP! If you’re interested in an up close and personal view, visit me on Youtube.